Processes all sizes of film from intra-oral size, to panoramic and cephalometric (full skull size). High quality, archivable radiographs are delivered dry in five minutes. Endodontic films may be viewed wet (archival) after only two minutes 30 seconds. Has high capacity external reservoirs for processor chemistry and recirculation pump for automatic chemical recycling with extended chemical life. Includes unit self-filling from developer and fixer reservoirs. Easy-to-use daylight loader (optional) eliminates the need for a darkroom. Films are processed automatically on insertion of the film. Unique film transport system ensures consistently excellent results.Electronic management system shows machine status and help codes. Compact dimensions, simple installation and minimal servicing. The Velopex Xtender offers the ultimate in x-ray film processing efficiency, reliability and convenience for the busy practice. The Xtender package comprises a top specification processor with high capacity auxiliary chemical reservoirs. An integrated recirculation pump provides automatic chemical filling and recycling for optimum chemical life. The Xtender processor saves time and reduces patient recalls. Dry-to-dry radiographs of high quality are available in just five minutes, supporting the dentist's diagnosis while the patient is still in the operatory. A preview facility allows endodontic films to be viewed wet within 150 seconds (archival). The Velopex Xtender is very easy to use. Switch on, and the processing chemicals are brought to working temperature automatically. Post the films through the entry slot in any order irrespective of size and the machine’s auto-sensor immediately initiates the processing cycle, developing them dry-to-dry automatically. An electronic management system provides at-a-glance information on machine status. An indicator panel shows when the unit is warming up, when it has reached operating temperature, and how long before a posted film will appear. Audible signals advise that a film is safely within the transport system and that the next film can be inserted. Self-diagnostics warn of any fault in the machine’s operation, displaying the relevant error codes to assist rectification. After the final film has been processed, the Xtender goes into stand-by, which is indicated by 3 horizontal dashes straight across the display. Stand-by allows the Xtender to automatically maintain the correct chemical temperature for immediate further use, thus saving electrical power and water. 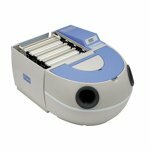 The Xtender develops all sizes of x-ray film from intra-oral (22 x 33mm) to panoral and full skull format (240 x 300mm). The entry slot incorporates a built-in guide for organising small sized films. A convenient, rigid daylight loader can be supplied when required. This eliminates the need for a darkroom with its associated risk of film fogging, and relieves staff from working with chemicals in a dark, confined space. The loader may be fitted later if the unit is to be upgraded from darkroom-only use. The integral tanks are supplemented by auxiliary sealed reservoirs, creating a high capacity system with ample developer and fixer for heavy usage in the busiest office. The compact, smartly-styled Xtender can be supplied with an optional robust stand, which also provides convenient housing for the auxiliary tanks and recirculation pump. Installation is simple, requiring only a power socket. The unit can either be plumbed in using a cold water supply and water outlet – or alternatively with a closed-loop water reservoir independent of plumbing (a useful option where plumbing on site presents a problem). A specially designed triple pump connects the auxiliary reservoirs with the processor, automatically topping up the processing chemicals, recirculating the developer and fixer and gradually recycling the entire volume of chemistry. Continuous recirculation of the solutions within a sealed system extends their service life and helps maintain effective processing performance. The pump can additionally be used to recirculate a sealed wash-water supply, avoiding the need for connection to mains water. Charging the machine is simplified by self-filling from reservoirs. The recirculation system may also be used to simplify the cleaning of tanks at the time of chemical change. THE DAYLIGHT LOADER IS OPTIONAL - When used ensure the Daylight Loader sits level with your Xtender. The Xtender and Daylight Loader must be fully supported by the same counter.